There are QuikTrips all across metro Atlanta, but none were quite like the QT in Norcross which played host to QuikTrip's Pit Party. Enthusiastic fans of NASCAR and Atlanta Motor Speedway came from far and wide to join the big bash for the upcoming Folds of Honor QuikTrip 500 - including one man who traveled all the way from South Dakota. "We were going to drive down to Louisiana to pick up a friend today and head to Charlotte tomorrow, but I got halfway between Sioux Falls and Kansas City and found I had some Bubba (Wallace) cars in my car for next week and thought, 'He's going to be in Atlanta, might as well go down there and get some signed,'" said Steve Letscher, who added he aims to make the trek again for the Folds of Honor QuikTrip 500 weekend on Feb. 22-24. 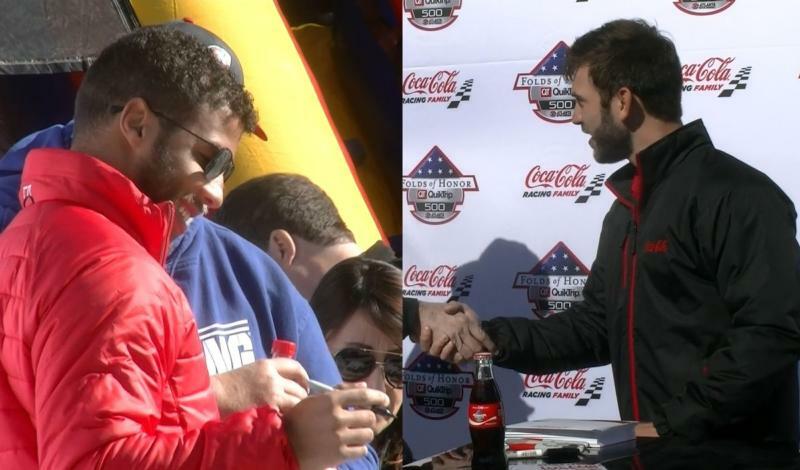 Another fan woke up bright and early, hopped on his bicycle and rode for two hours to be first in line to meet Coca-Cola Racing Family drivers Bubba Wallace and Daniel Suarez. "As soon as they posted the party on Facebook I was like, 'Well shoot, I'm gonna be there,'" an ecstatic Diego Cascaneda said. "It's honestly an amazing experience." The party wasn't just a good time for fans. Wallace and Suarez said they enjoyed spending time with the fans before the season kicks into high gear. "It feels so good. I wish we were coming to Atlanta more often instead of just once every year," Suarez said. "I really enjoy times like this where I'm not thinking about the racecar; I'm not thinking about a race; I'm just thinking about having a good time with (the fans) and that's what it's all about." "It's cool and it's really humbling to have so many great fans come out and enjoy the day," Wallace added. The party serves as a kick-off of festivities leading into Atlanta's NASCAR weekend. With a new rules package making its debut at the Speedway this year, the race - and its unknowns - loom large. "We're kind of bunching up the field on a 1.5-miler where aerodynamics are pretty sensitive," Wallace said. "It'll change up the format a lot. "I think all of us have a question mark for what's going to happen this season. I guess we'll find out at Atlanta." Atlanta's NASCAR weekend returns to Atlanta Motor Speedway Feb. 22-24 with Monster Energy NASCAR Cup Series qualifying on Friday, the Rinnai 250 XFINITY Series race and Gander Outdoors Truck Series race on Saturday, and the Folds of Honor QuikTrip 500 on Sunday.